Collingwood, an industrial and residential suburb, is 3 km north-east of central Melbourne. Its western boundary is Smith Street, Fitzroy, and its southern boundary is Victoria Parade. On its east are Clifton Hill and Abbotsford, both included in the former Collingwood municipality. It was named after Admiral Lord Collingwood, who fought at Trafalgar. 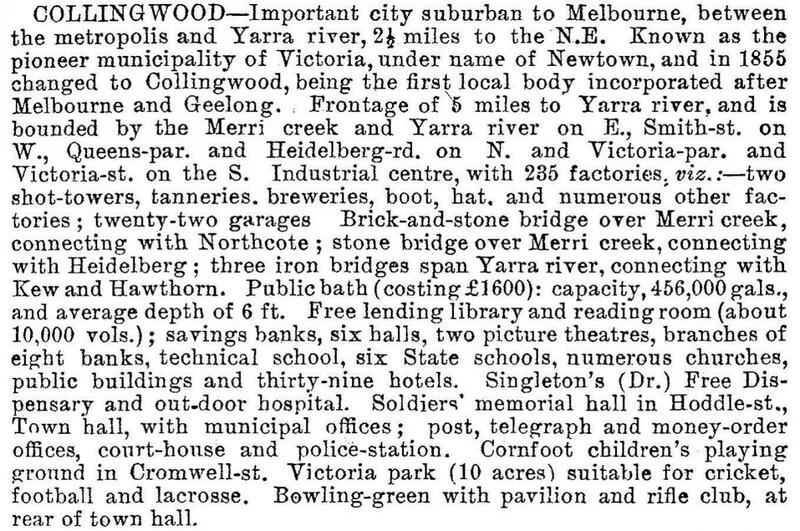 Along with Fitzroy, Collingwood was subdivided in 1838 into allotments each of about 12 ha. At that time both districts were generally known as Collingwood, although the Fitzroy part was differentiated by being known as upper Collingwood or Collingwood west. It was the elevated part, as the land falls away to a plain about 200 metres east of Smith Street, otherwise known as the Collingwood flat. Stormwater drained from the elevated part along today's Alexandra Parade and thence south-east from Smith Street to near the Victoria Park football ground into the Yarra River. The entry to the Yarra was a swampy area. Buyers of the 12 ha allotments set about further subdividing them for resale, and by 1854 nearly all but the swampiest parts were cut up. Settlement intensified after the gold rushes, and the area was exempt from building control laws, which encouraged the concentration of cheap houses on small blocks of land. The flat topography made subdivision easy. Increasing urbanisation in elevated Fitzroy increased stormwater run-off, and east Collingwood was frequently flooded. The impervious subsoil caused stagnant sheets of water. Calls for drainage were neglected by Melbourne City Council, which had jurisdiction over Collingwood. On 24 April 1855 Collingwood became a municipality. It was called East Collingwood until 1873, when it was proclaimed a town. Between 1856 and 1860 primary schools were opened by the Methodist, Independent, Free and Catholic churches. 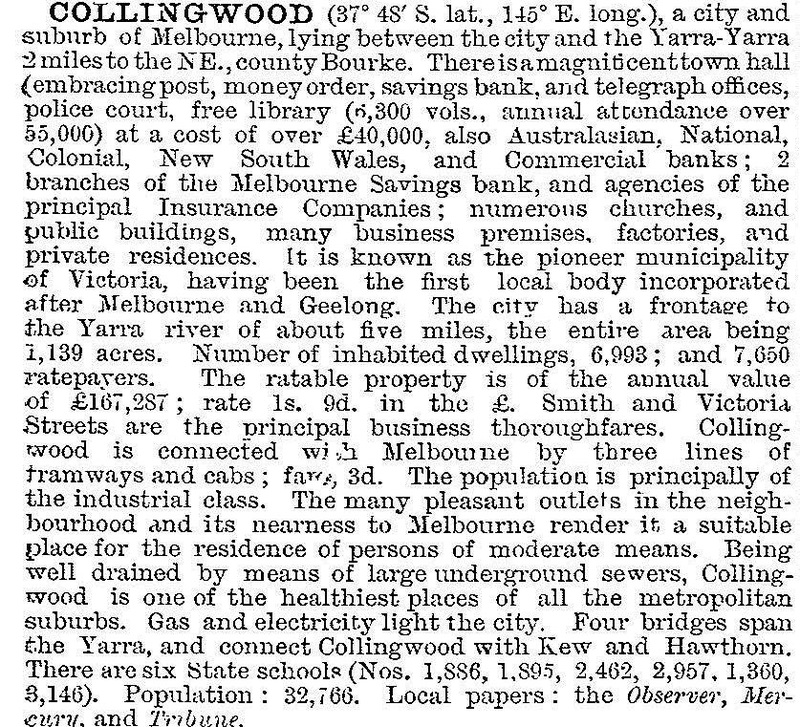 Collingwood's early civic and commercial centre was in Johnston Street, which was a route to the eastern suburbs via the bridge (1857) over the Yarra River. A town hall and police court were built on the site now occupied by the Neighbourhood Justice Centre (formerly a TAFE and Collingwood technical school). The Yarra River on Collingwood's east attracted industry. In 1840 John Dight hewed out a mill race through the basalt rocks in the river near where the Merri Creek joins it. He operated a mill for flour making, with varying success. A more productive use was harnessing the water for wool washing. Local councillors advocated the repeal of laws for Yarra River water purity, arguing that effluent from noxious trades was merely an addition to the sewage from Fitzroy and the Collingwood flat. By 1857 the Reilly Street drain (now under Alexandra Parade), had been built, and discharged into the Yarra with reasonable efficiency except when over-filled with stormwater or brewers' waste. The purificationists struggled against the advocates for ‘unlocking the Yarra’, to provide employment for workers after the gold boom. 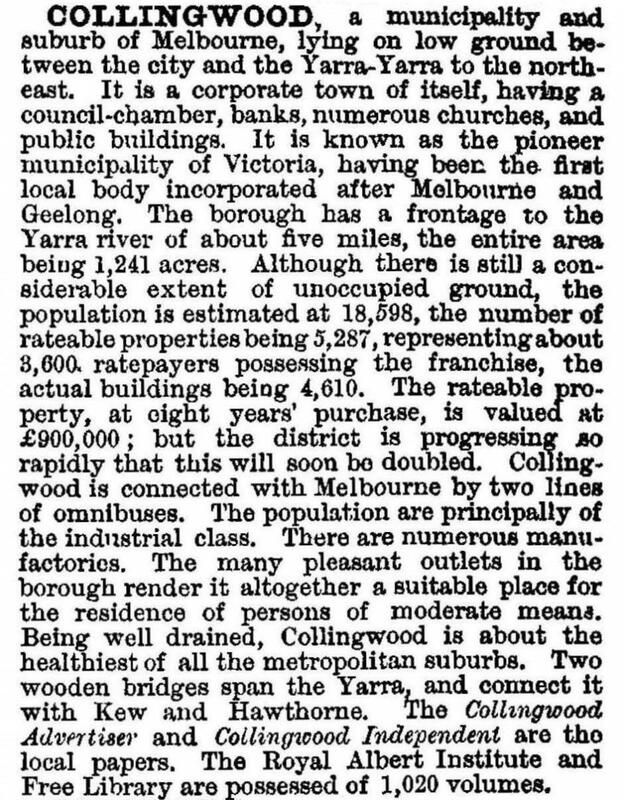 On 14 January 1876, Collingwood became a city. A tram service from the city to Smith Street was opened in 1887, adding to Smith Street's regional shopping role. Train services to Collingwood were not of much convenience to its resident workers. 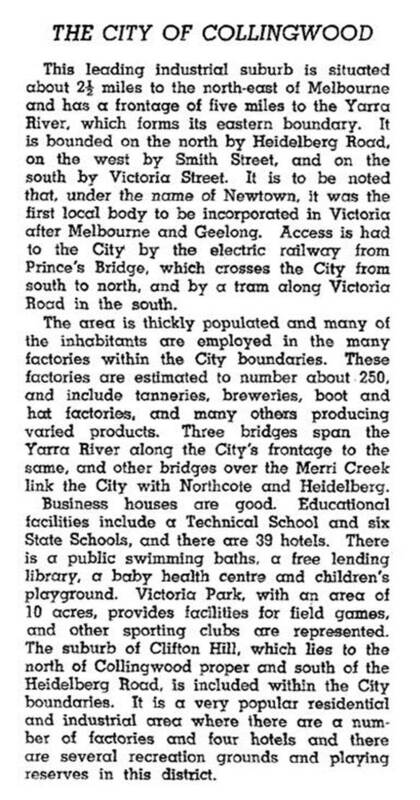 No direct connection to the city was available for some time, the line being an indirect one which ran from Heidelberg via Fitzroy, Carlton and North Melbourne to the city (1888). Consequently residents' employment was concentrated in local factories. Footwear, hats and garments were locally made in large quantities. Collingwood's famous John Wren (tote operator and sporting entrepreneur) was a boot clicker in his early working life. After 1890 Collingwood's population stabilised. Some old shacks were demolished for factories, an example being the Foy and Gibson's factories and Gibsonia woolen mills east of Smith Street. A train service direct from the city to Collingwood was opened in 1901, opening Collingwood's factories to a wider workforce. A tram also ran along Johnston Street from 1887 to 1939. Collingwood gained a reputation for working-class culture and tenacious support for the local football team. It continues to maintain a high level of club membership. Between 1902 and 1936 the club won 11 football premierships, including an unbeaten four in a row in 1927-30. The club also gained an agreement for undisputed use of the Victoria Park oval, formed on Dight's Paddock by the council. The club won premierships in 1902, 1903, 1910, 1917, 1919, 1927, 1928, 1929, 1930, 1935, 1936, 1953, 1958, 1990 and 2010. In 1877 the non-Catholic primary schools closed when the State school was opened in Cambridge Street. State schools were opened in the neighbouring localities of Abbotsford (1877), Clifton Hill (1874 and 1891) and Victoria Park (1889). A technical school was opened in Johnston Street in 1912 on the former town hall site. The Catholic primary school, originally in Ryrie Street (1859) continued in Otter Street and St Joseph's boys' technical school in Nicholson Street continued until the 1990s when it was leased for a Rudolf Steiner inner city school campus. In 1915 a school of domestic economy was opened next to the Vere Street primary school (1882), becoming a coeducational high school in 1968 and the Collingwood Education Centre in the 1970s. The Victorian Housing Commission built numerous estates in outer suburbs in the postwar years, encouraging an exodus of residents from inner suburbs. The inner suburban cottages were taken by postwar migrants. Greek and Italian migrants accounted for 8% of Collingwood's population in 1954, 21% in 1961 and 27% in 1971. Fifteen years later residents born in Europe and Asia were 23% of the population, and those from south-east Asia 8.2%. In 1958 the Commission moved into Collingwood, demolishing cottages near Johnston and Hoddle Streets. Three-storey blocks were built, and later twenty-storey blocks (1967-71), for over 2000 people. They almost halted the municipality's population decline, but it was renewed by the mid-1970s. The population decline lessened the local catchment for the Smith Street shops, and the growth of Bourke Street, Melbourne, since Sidney Myer opened there in the 1920s, eroded Smith Street's regional shopping role. G.J. Coles and Co started its first variety store in Smith Street in 1912, and left there when variety stores were superseded by Kmarts and supermarkets. The density of subdivided land at the rear of Smith Street has discouraged the opening of a drive-in shopping centre, which would probably have drawn patronage away from the strip. The exceptional land parcel is the gigantic suite of industrial buildings once used for Foy and Gibsons garment manufacturing, but some of them are on the Victorian Heritage Register. By the 1990s Collingwood underwent moderate gentrification. Housing prices reflected the change: in 1987 Collingwood's median house price was 86% of the median for metropolitan Melbourne, rising to 117% in 1996. Abbotsford and Clifton Hill, from higher base figures, behaved much the same. On the other hand, a report in 1997 showed that 21% of Collingwood's children were in families on a welfare benefit or classed as working poor. Only 10 of 57 metropolitan suburbs had more children classed as working poor. Within 10 years Collingwood's position had improved: timber cottages brought high prices, but there is a high low-income population in government housing and flats. Fortunately, the intake of drug dealing residents in the high-rise flats was corrected and most occupancies changed to family units. Drug dealing in Smith Street decreased correspondingly. A mural (1984) painted on the wall of the old Collingwood Technical School by New York street artist Keith Haring was restored (2013-14), but again damaged by graffiti taggers in early 2015. The mural was added to the Victorian heritage register in 2004. On 22 June 1994, Collingwood city was united with Fitzroy and Richmond cities to form Yarra city. Some houses in Collingwood were earmarked for demolition for the East West Link.